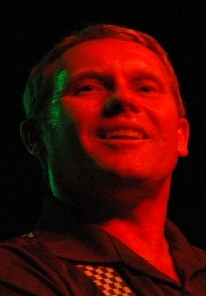 Dave Wakeling is the lead singer for The English Beat, one of the key bands in the British ska revival during the late 70’s and early 80’s, along with The Specials and Madness. The English Beat’s songs included the hits “Mirror in the Bathroom”, “Save it for Later”, “Too Nice to Talk To”, and covers of “Tears of a Clown” and “Can’t Get Used to Losing You”, all of which still sound fresh some thirty-odd years after their first release. After The English Beat broke up, Wakeling co-founded General Public, which released the hit songs “Tenderness” and “I’ll Take You There”.